At first people were happy with Solon’s changes. They had their farms back, and they didn’t owe any money, and they weren’t being killed for little things. They could (if they were free men) be judges and vote in the Assembly. But the people of Athens didn’t stay happy very long. They began to lose their land again and fall back into debt. When the Athenians lost a couple of battles against their enemies, that was the last straw. In 560 BC, one rich man, Pisistratus, told the ordinary people that if they supported him as tyrant, he would help them with all their problems and keep the other rich men off their backs. People thought that sounded good! So Pisistratus managed to get power over the other rich men of Athens and get control of the city. Pisistratus did a good job as tyrant, even though the other rich men kept trying to get rid of him so they could have their oligarchy back again. Pisistratus taxed everybody equally (instead of taxing the rich less than everyone else). He organized ways for the government to lend money at fair rates to farmers so they wouldn’t have to borrow money from rich people. He also got lucky: the Athenians found big new silver mines at Laurion, near Athens, and forced slaves to dig up tons of silver there. Pisistratus (pie-SISS-trat-uss) used the tax money to build roads and new public water fountains and new temples for the gods and many other useful things. He fought successfully against Thebes to the north and Corinth to the south. When Pisistratus died in 528 BC, his son Hippias (and possibly his brother Hipparchus) took over as tyrant. (You can see that they are rich men because their names mean “Horse-guys”, and only rich men could afford horses.) But fourteen years later, in 514 BC, two young rich guys named Harmodius and Aristogeiton (arr-iss-toe-GUY-tahn) seem to have tried again to get the oligarchy back into power. They tried to kill Hippias and Hipparchus at a religious festival celebrating Athena‘s birthday in 514 BC. They only managed to kill Hipparchus, but Hippias got more and more suspicious and nasty, and by 508 the Athenians decided to get rid of Hippias too. 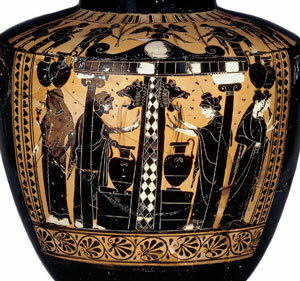 The Alcmaeonids bribed the priestess at Delphi to tell the Spartans to help them throw out Hippias. The Spartans did help, and Hippias fled to Iran. That was the end of tyranny in Athens. Cite this page: Carr, K.E. 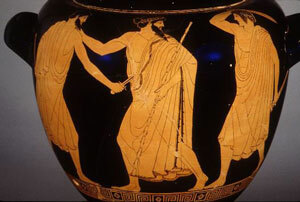 Athens under the Tyrants – Ancient Greece. Quatr.us Study Guides, July 6, 2017. Web. April 23, 2019.